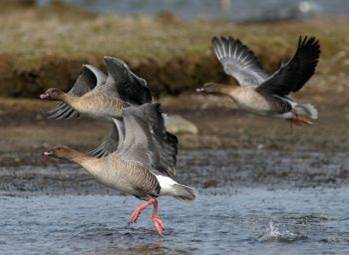 The AEWA International Species Management Plan  (ISMP) for the Svalbard Population of the Pink-footed Goose was adopted at the 5th session of the AEWA Meeting of the Parties in May 2012, in France. In addition to the general framework for conservation efforts provided by the AEWA ISMP, range states are also encouraged to adopt National Management Plans for the Svalbard pink-footed goose. For more information on other Single Species Action or Management Plans adopted under AEWA, please visit the AEWA website .